Today I’m sharing something I’ve been super excited about for a few months now–my protein-packed peanut butter chocolate smoothie! This recipe is super yummy, full of protein, and only 3 Weight Watchers points! It’s extremely filling and will keep you full for several hours. I love drinking it after a good strength training session especially. The key to a good protein smoothie is, surprise surprise, good protein! I buy this chocolate protein powder and it’s about $50 for like three pounds of powder, so it lasts quite a while. The best part is that this protein powder is only 90 calories for 1 scoop and has 20 grams of protein per scoop! Some protein powders are super sugary as well but this one only has 1 gram of sugar per scoop as well. Sometimes if I want some protein or am in a huge rush for breakfast, I will mix one scoop with about a cup of hot water, mix it up and drink it really fast. The warmth kind of makes it feel like hot chocolate and also for some reason makes me feel more full. 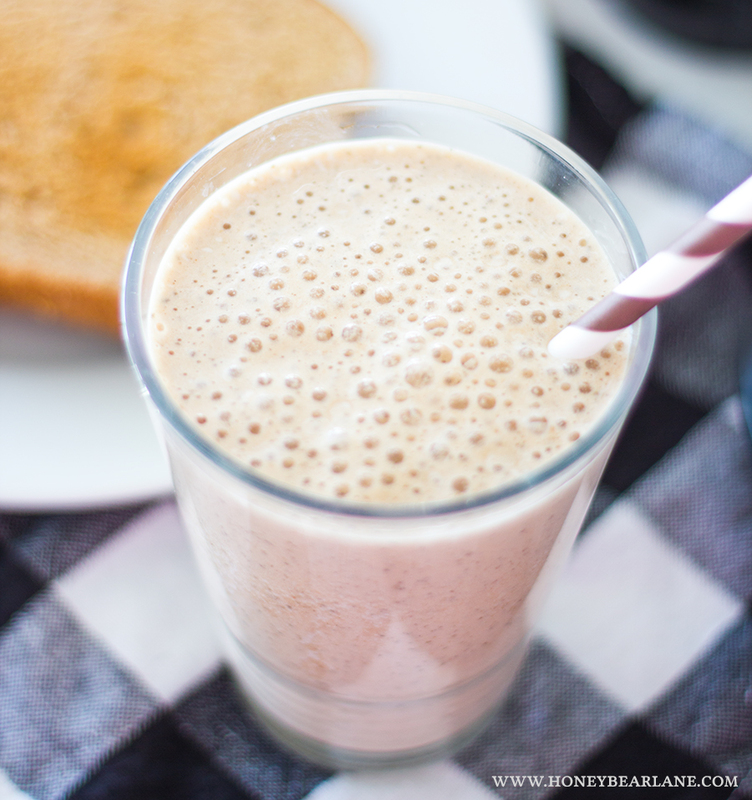 The second key ingredient to this smoothie is PB Fit. It’s a peanut butter powder which if you haven’t tried these yet, is a really low fat alternative to regular peanut butter. You can mix 2 tablespoons with water and make regular peanut butter but my favorite way to use it it in this smoothie. It contains 6 grams of protein, with only 50 calories and 2 grams of sugar per serving. And the fat is only 1.5 grams per serving which is 90% less fat than traditional peanut butter! Finally I add a banana and some milk and you can add almond milk if you prefer, but I don’t always have it. 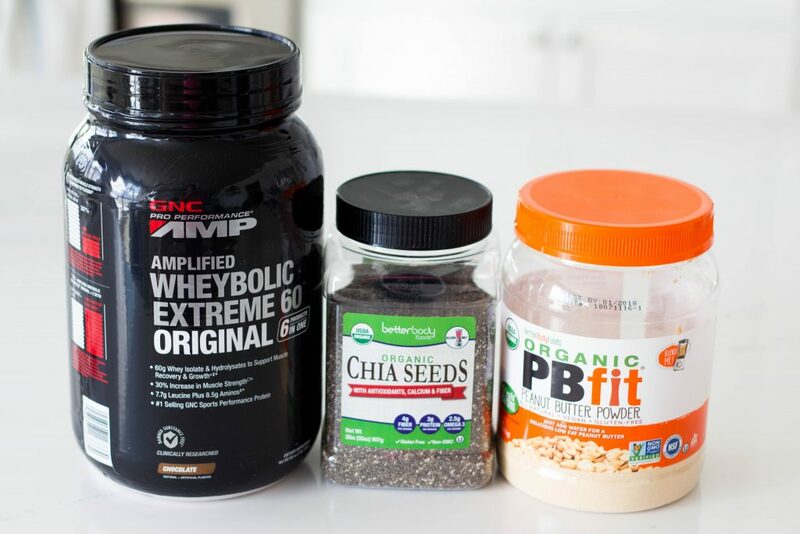 And if you want an extra boost, you can throw a scoop of chia seeds in there too. The chia will add another 60 calories but has 3 more grams of protein and 4 grams of fiber. It’s really nutritious. So between the protein powder, PB Fit, chia, and almond milk, you’re getting at least 31 grams of protein in one meal! Since the recommended amount of daily protein is about 46 grams, this is a great start to the day. 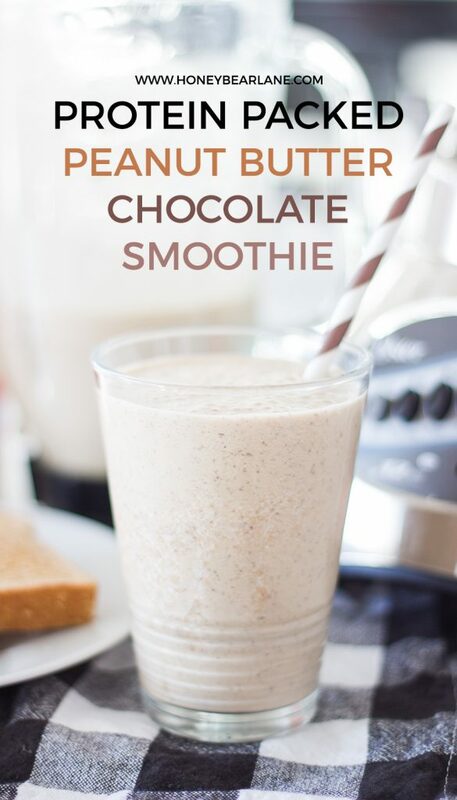 I seriously love drinking this peanut butter chocolate smoothie for breakfast or even for lunch sometimes. And it makes a lot so you can share it with your kids or save some for later! *This post contains affiliate links. See my disclosure here.